Overview: Ugh! is not a game about fuzzy slippers from Australia or helicopters flown by cavemen. 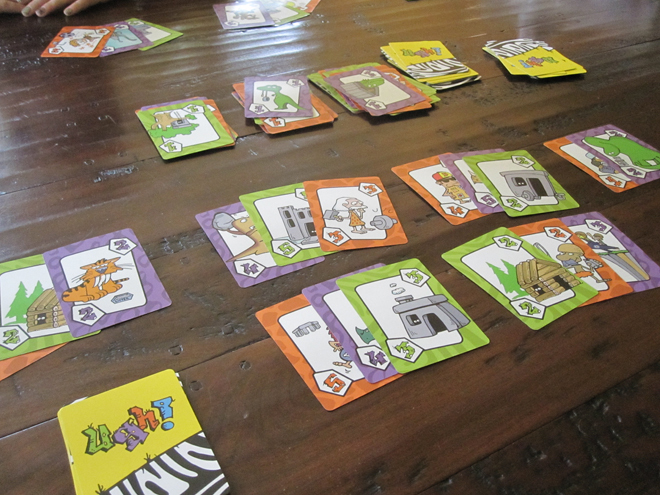 It’s an invigorating card game from Calliope Games that involves matching and multiplication with press-your-luck mechanics and a little light strategy. Ages: 8 and up (though scoring can be a challenge for younger kids). Retail: $10 and available later this month (Edit: See shipment update at bottom of post). Who Will Like It? Because Ugh! is so simple to pick up & play, it has appeal for non-gamers and, with a little strategy, will also appeal to serious board gamers looking for a little palate cleanser between longer games or while waiting for the rest of the group to arrive. Components: In the pack, you’ll find 110 brightly colored cards of standard weight and a set of rules. The artwork is by GeekDad favorite John Kovalic and, as can be expected from Kovalic, is brilliantly funny. Gameplay: You can find a pdf of the instructions on the game’s website, but here’s a quick overview of gameplay. Each player wants to accumulate the most points by locking in sets of cards that represent one card from each of three color groups: purple, green, and orange. Play begins by a player drawing from the draw pile. Each player can draw up to four cards, discarding the first three cards face-up into one of three safety piles. Players have some choice in strategy, but want to find a card with a high number associated with it. If a player has opted to discard the first three draws into the safety pile, the player is forced to take the fourth card and put it in their pool. After drawing a card, players can then lock in a set of green, purple, and range cards, which are then protected from loss against steals or forced discards (more on those in a moment). Rather than draw from the draw pile, a player may also draw from one of the safety piles. If a player draws an Ugh! card, designated by a negative number or set of instructions, that player’s turn is immediately over and that player may be forced to discard a number of cards equal to the negative number or the instructions. In the deck, there are also a number of Wild Cards, which allow a player to steal a card of corresponding color from another player. Strategy will change from game to game, but it’s a good idea to lock up sets as soon as you can, especially when your hand has some high numbered cards. When the cards are gone from the draw pile, the game is over and the scoring begins. Players multiply the numbers in their sets and then add them up (4 x 3 x 5 = 60, 2 x 1 x 4 = 8 for a total score of 68). Conclusion: Not only is Ugh! a of of fun, it’s pretty affordable. (When was the last time you saw a game for $10?) Because the artwork is funny, bright, and cheery and the gameplay moves quickly, Ugh! has become a staple during our game nights. The one difficulty is that for kids and some adults, keeping track of scoring can be a bit of a challenge. At our house, we welcome the challenge as a way for our fourth graders to practice their math – a little pencil and paper goes a long way. Update: I’ve just heard from Calliope Games and, unfortunately, the shipment containing Ugh! has been delayed and Ugh! will likely arrive just after Christmas. Bad timing, but it was out of Calliope’s control.